If you have ever wondered why your attempts at communication get a little distorted, it could be because some of the cultural and language wires have gotten a little tangled. 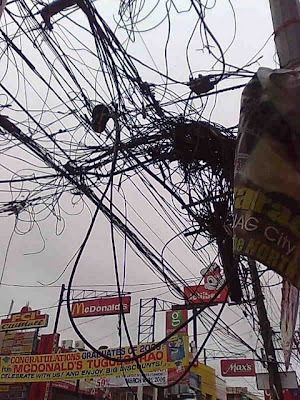 I have a feeling that the folks that run wires here don’t try to find the problem, they just put up a new wire. At least the birds have a lot of places to sit. I just spent a week away from home working on translation. I was going over several local translations with a language helper and, figuratively speaking, trying to cut out all the wires don’t communicate to our Isnag friends and find the ones that communicated Bible truth effectively. I really appreciate Malana’s willingness to come out of the village to work with me. We were able to put in long days without the distractions we sometimes get in the village. I came away with pages and pages of information which I will now work on in my office in Manila in order to come up with the first draft for the Southern Isnag. While I was up north, I was blessed by Carl Stevens’ family and their ministry partners. They let Malana and I use an air conditioned office at their ministry location and had us over for dinner a couple of times. Wednesday morning Carl volunteered to be and ambulance driver for us. Our partners in the village had a patient flown out of our tribal location to the city I was working in, so Carl and I met the plane and took the patient to the hospital. The patient’s name is Grace and she is a good friend of our family. She was very weak and had been having a very high fever. Prayer for her would be appreciated. A couple of interesting things happened on my trip. When I got on the airplane to fly back to Manila they had an unusual announcement. You know how on ships they call, “All ashore that’s going ashore!” Well, as we were finding our seats after having gone through several security checks they announced, “If you don’ t have a ticket you shouldn’t be on the plane.” Hmmm… Well, the guy lying under my seat didn’t seem to hear, but I didn’t want to disturb him…. Just kidding! The second thing had to do with wild animals. Either my eyesight is really getting bad or the ants in our hotel room were incredibly small. I’m sure it was the latter. These ants were so small I couldn’t see them unless four of them stood next to each other which they didn’t do often. They were very small, but all teeth. They hid in my clothing and didn’t really start chomping on me until I was walking down the street. That made for some interesting dance moves on my part. People probably thought I had some sort of twitchy nervous disorder. I’m glad to be back with my family and excited about the progress that I’m making on the S. Isnag translation. Great blog post! We loved the stories and pictures. That was an interesting announcement on the plane... Glad you're home safe and sound, and we hope those invisible ants didn't follow you home!